At least 58 people have been sickened, and two — one in California and one in Canada — have died because they contracted E. coli O157:H7 in November and December, believed to be related to eating romaine lettuce or other leafy greens. In the United States, the U.S. Centers for Disease Control has linked at least 17 reports of illness in 13 states to the outbreak. Food safety technology has improved significantly in recent years as molecular microbiology, electronic data sharing and analysis of matching genetic relatedness has advanced, reported Samantha Masunaga in the Los Angeles Times. The comments are from UC Agriculture and Natural Resources Cooperative Extension specialist Trevor Suslow, who is featured in a Q&A about the food safety problems suffered by the fast-casual restaurant chain Chipotle Mexican Grill. 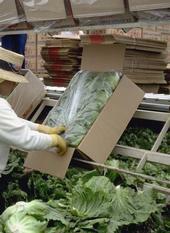 UC ANR to help growers comply with new food safety rules. While the U.S. Food and Drug Administration puts the finishing touches on the latest version of the Food Safety Modernization Act, UC Agriculture and Natural Resources advisors are planning how they will help farmers comply with new provisions, reported Taylor Hillman on AgNetWest.com. Hillman spoke to Mary Bianchi, the director of UC ANR Cooperative Extension in San Luis Obispo County. She said most growers already have many components the act requires, such as their nutrient management plan and their irrigation plan. Americans often under cook meat and don't wash hands properly. Irradiating meat can reduce Salmonella and Camphylobacter levels to almost zero, making it safer for consumers who aren't handling raw meat properly, according to a UC consumer behavior and food science expert who was quoted in Food Quality New. However, the practice is not gaining traction.